“Governor Cuomo’s anti-prison budget cuts created the opportunity for those two convicts to escape from Dannemora,” a retired correctional officer who worked at the Clinton Correctional Facility in Dannemora, New York for three decades tells Breitbart News. Late Friday night/early Saturday morning, two convicted murderers serving time in the Clinton Correctional Facility, Richard Matt, 48, and David Sweat, 34, escaped by cutting through their cell walls using power tools, then crawling down to the steam pipes, which they followed underground to a location about 150 feet outside the prison walls. They then cut through a padlocked manhole and emerged outside the prison at the intersection of Barker St. and Bouck St.
Dannemora is located 20 miles south of the Canadian border, 15 miles west of Plattsburgh, which is located on Lake Champlain. “Cuomo has been cutting back on prisons since he took over as governor,” the retired officer says. The escapees were seen at 12:30 am Saturday, shortly after they climbed through the manhole, by a young man who resides in a house nearby, probably on the corner of Barker St. and Bouck St. The young man yelled at them to get out of his yard and they ran off. They have not been seen since. “Lucky to be alive, man,” the man told ABC News today. When he confronted them at the home, which was near the manhole that the prisoners used to escape, one of the men responded “We’re just lost. We don’t know where we are. We’re on the wrong street,” according to the witness. According to the retired correctional officer who spoke with Breitbart News, budget cuts have led to lax inspection of outside contractors as they come and go from the prison. Equipment inventory counts from crews as they enter and leave the prison are often missed since the Cuomo requested budget cuts. According to the officer, there is no way the convicts could have obtained the power tools news reports say the two convicts used to cut through their cell walls from within the prison’s own inventory of tools. “There’s a certain group of tools that are called Class A tools. These are the more dangerous tools, like power tools and drills. Inmates cannot have these unless under supervision,” the officer explains. “For an inmate to get a Class A tool, he has to request it, using a form. Then an employee has to get it from the inventory of Class A tools in the locked tool area. There’s a shadow board where the tools are kept. Every tool out is missing on the shadow board. We can immediately look at that shadow board of tools every night, and know if one’s missing,” the officer adds. “All the tools are checked every night. No way the prisoners who escaped could have gotten a drill or power tool, from inside the prison. It came from the outside,” the officer says. The retired officer then explained the lax inspection of tools brought in by outside contractors is just one of many security problems created by Governor Cuomo’s budget cuts. “They’ve compressed their work day they’ve got to be busy doing some job all the time, so that practice we used to have of a correctional officer just checking everything out doesn’t happen any more,” the officer notes. The retired officer points to another recent incident of budget cutbacks. The retired officer says that Cuomo’s much publicized recent visit to the prison was damage control for the governor. “It’s a political football. Cuomo wants to show everyone his cutbacks aren’t endangering the public, but it’s obvious they are. He’s anti- prison,” the officer tells Breitbart News. The retired correctional officer also says that one of the escapees had a visitor at the prison one day before the escape took place. That visit may have been to finalize plans for the escape. In addition, ABC is reporting that Joyce Mitchell, a supervisor in the prison’s tailor shop, is currently being questioned about the escape. Last night, the retired correctional officer spoke with several correctional officers currently employed at Clinton Correctional Facility. “They said that the news reports are true,” the retired officer tells Breitbart News. “She’s talking now a lot. Apparently she was involved. She was a training supervisor. She trains the inmates how to sew,” the retired officer says. “Apparently she was supposed to be the getaway driver, maybe had cold feet and didn’t go ahead with it. She checked herself into a local hospital instead,” the officer adds. A second retired correctional officer who worked for decades at the Clinton Correctional Facility in Dannemora tells Breitbart News he is certain the escapees had outside help. “The prison is built on bedrock and it is impossible to tunnel out from below,” the second retired correctional officer tells Breitbart News. “The walls were made from concrete mixed with iron ore tailings. This makes the concrete super hard. At one point the wall turned a bit orange with rust from the ore tailings. When they brought a crane in to knock down part of the wall for a new truck port, the crane wrecking ball just bounced off. They pretty much had to jack hammer the wall. So it pretty much makes the jail impossible to get into or out of,” the second retired officer says. “It went too well for just a friend on the outside to have been the helper. The manholes [in the village of Dannemora] are all chained shut. They had to have brought the tool with them to cut the chain on the manhole. All that work and planning to just get out and run into the woods? Not happening. They were too smart for that. They were picked up and taken out of the area,” the officer says. Two inmates who escaped from a maximum security prison near the Canadian border were housed on an “honor block” at Clinton Correctional Facility, giving them more liberties, including the ability to cook and visit other inmates’ cells at times, according to a person briefed on the matter. The looser restrictions on the honor block tier may have been a factor in the meticulous escape plan of Richard Matt, 48, and David Sweat, 34, who used power tools to cut holes in the backs of their adjoining cells in order to access a steam pipe that led them to freedom. The inmates’ assignment on the honor block also allowed them to wear and keep regular clothing other than their prison uniforms. The person briefed on the case, but not authorized to comment publicly, said the green prison uniforms were were found discarded in the sewer pipe that the men used to climb out of a manhole cover a block from the prison. Residents of the small village of Dannemora just beyond the walls of the prison seemed to be in agreement that inside, as well as outside help, was involved. “Definitely an elaborate escape. Must have had help from inside and out. All tools are accounted for that belong to the prison, but it could of been a contractor’s employee. Several weeks in the making. With such an extraordinary escape I’m sure there was a pick up on the outside,” one resident said. Michael Leahy lived in the village of Dannemora from 1963 to 1967. He attended the public elementary school, since torn down, that was adjacent to the old Dannemora High School building, which still exists and has been converted into offices. 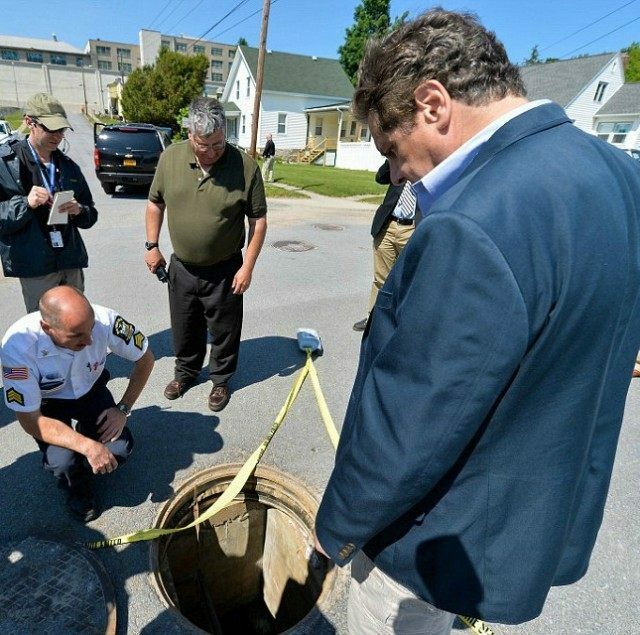 The manhole from which the two escaped convicts emerged late Friday night/early Saturday morning is located at the intersection of Barker St. and Bouck St., the location of the old Dannemora High School building.